Ready to get started? Choose your landing site on the Moon! Not certain which region to select? Click on the region name above (such as "Sea of Tranquility") to access a detailed description and location information. It's that easy to buy moon property! WE DELIVER EVERYWHERE AROUND THE WORLD! The Luna Society has members in every country around the world. A nominal fee is added to cover basic shipping and handling charges. If you require faster delivery, expedited shipping is available at an additional charge. Your personalized Lunar property claim and ownership package includes a beautifully engraved deed, a satellite photograph of the property and an information sheet detailing the geography of your property on the Moon. Complimentary Luna Society International lifetime membership. The interactive Full Moon Atlas on CD-ROM for Windows PC is available as an option at additional cost. Giving moon property as a gift? We'll include a FREE personalized gift card at your request. Shipping and processing fees are additional. Express and priority delivery is available as an option in limited locations. The proceeds from your purchase assist Luna Society International and its partners toward the goal of privatized exploration, settlement and development of the Moon. 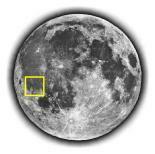 Lunar properties currently offered in the Lunar Land Owner are sold in minimum lots of one acre (approximately 43,560 sq. feet, or 4,047 sq. meters). You may purchase up to ten (10) acres per online transaction; please contact us for special pricing on larger purchases. All claims to property on the Moon are recorded in compliance with Title IV of the Space Resource Exploration and Utilization Act of 2015, Section 402, which states: "A U.S. citizen engaged in commercial recovery of an asteroid resource or a space resource shall be entitled to any asteroid resource or space resource obtained, including to possess, own, transport, use, and sell it according to applicable law, including U.S. international obligations." All property prices are stated in US$ per acre based on current exchange rates. What is the price in your currency? Pricing and availability current as of 26 April 2019.